The easiest peyote stitch, 8/0 cut seed beads for beginners, 10/0 or 11/0 Delicas for a finer look and feel, this is Chris's favorite stitch! Embellish the edges or top to create more dimension. More of a pain, we suggest only using odd-count peyote when you have a pattern that requires a center! It's really not that bad, but why add extra work if it's not necessary? 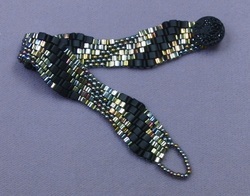 This fun pattern that uses 8/0 cut and 11/0 seed beads. Instant gratification! These earrings whip up relatively quickly and easily ... great gifts! Embellish peyote with perfect Swarovski pearls ... so perfect for holiday parties! Learn to encase a bead/cabochon/rivoli with peyote stitch. Great for earrings, bracelets and pendants! **Special Sale*** $15 plus supplies! Makes a great gift! Learn peyote to create a personal bookmark. You will have homework with this project! Chris created this chain with a single thread ... no elements to sew together! Learn how she does it. 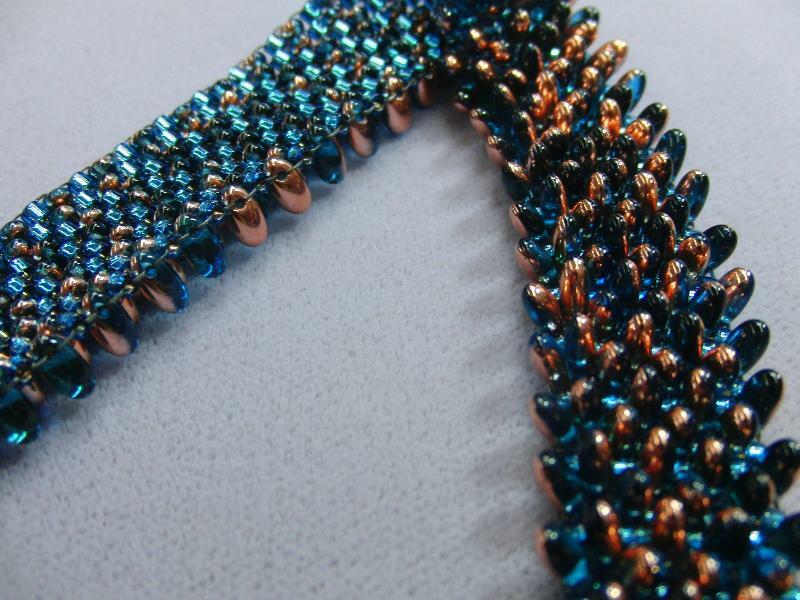 Using two colors of 11/0 seed beads, we'll wend our way 'round and 'round. Connect three sizes to create this pendant! Use Delica 10/0s or 3mm cubes for this fun variation on Peyote. We also use this technique for Russian Leaves; see how much you'll know! Twice as fast as regular or single-drop peyote, you can use whatever style beads you want! 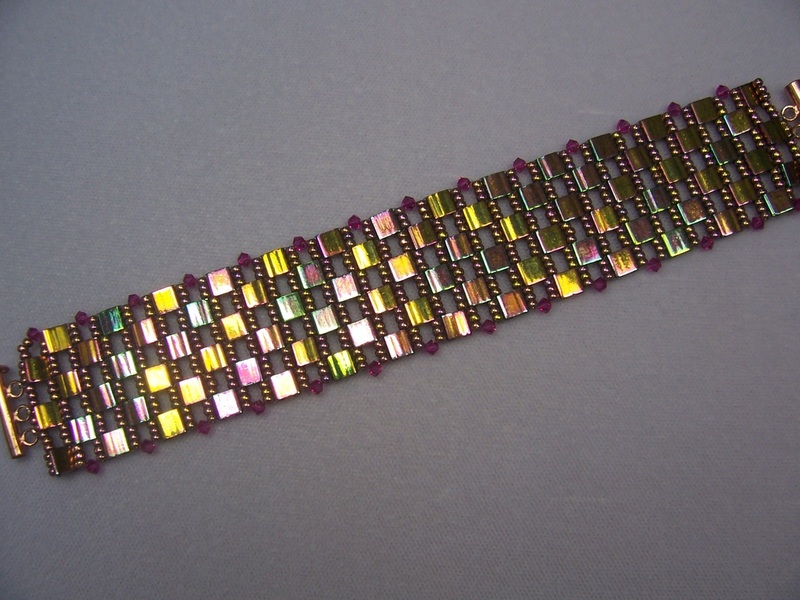 We used two colors of 11/0 seed beads with 3mm fire polished beads thrown in for interest. Using a variety of seed beads (and possibly embellishments like the pearls), learn this cool variation on tubular peyote. Use this fun version of peyote with Long Magatama beads to create this great pendant, or vary it for a bracelet! Using all types of shapes and sizes of seed beads and accent beads, learn to paint with beads! This is Chris's favorite stitch and style of beadwork. 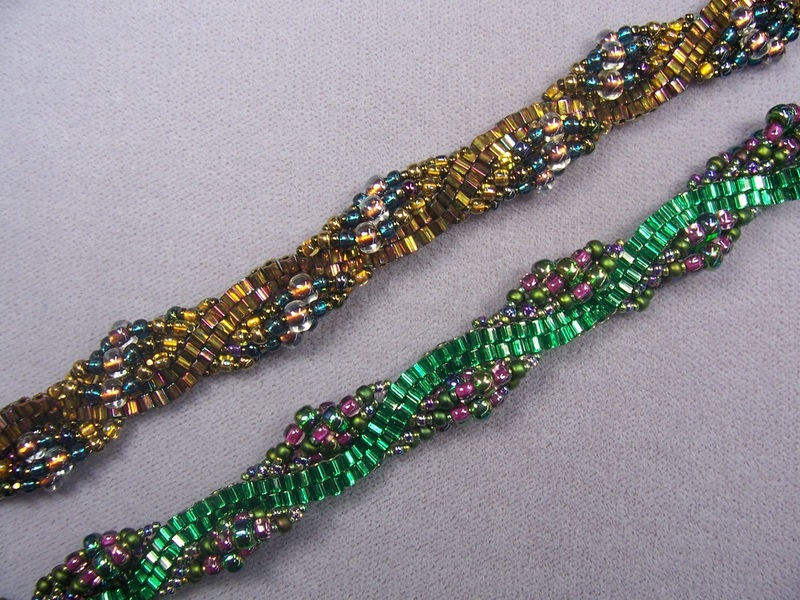 Learn to create and embellish peyote tube and rondelle beaded beads. You will be surprised how fast these beads whip up! ***Special ﻿Sale﻿*** $15 plus supplies! Don't know what to do with briolette beads? Check out this deceptively easy peyote necklace! Choose an original double-drop peyote pattern designed by Chris to learn how to create pictures with beads. Would you like to master the harder odd-count peyote? This is the class for you! Chris designed this pattern with a center which NEEDS odd-count ... don't be scared, we have a trick to make it easier! 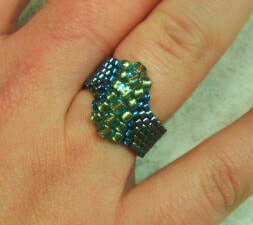 Pick out a fun focal bead and create this great ring! Learn to encase a Rivoli with beads, creating this spectacular pendant! Also makes great earrings and elements. 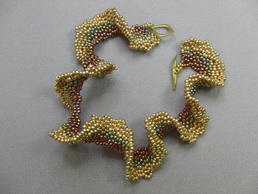 Using multiple colors of 11/0 seed beads, learn to increase peyote to create this ruffled beauty! Increase peyote on one side and get this fun, geometric bracelet! Come make some fun earrings with peyote stitch! So simple, and embellish them in many ways ... it's a great beaded bead. New Class!!! You decide what width you want by the size Bugle Beads you choose! 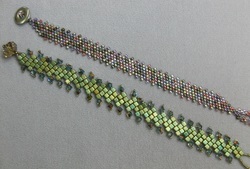 3mm, 6mm, or 12mm, paired with 11/0 seed beads will get you going with this easy technique. Peyote with drops and 11/0 seed beads ... looks like a Light Bright! Using two colors of Farfalle and two colors of 11/0 seed beads, learn even-count peyote while creating this regal piece. Relatively quick and easy! Create with one color or play with patterns. 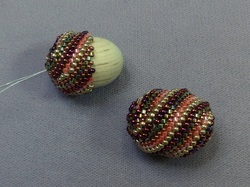 Learn to incorporate beads of different sizes in basic even count peyote ... then embellish the base! Using sizes 8/o and 11/o Toho Triangles and 11/o seed beads, you can easily create this fun variation of even-count peyote. This teeny-tiny peyote bracelet is so much fun ... you can play with different patterns or just be random! It is also a great project for your leftover Delicas! Totally awesome bracelet or lariat!!! 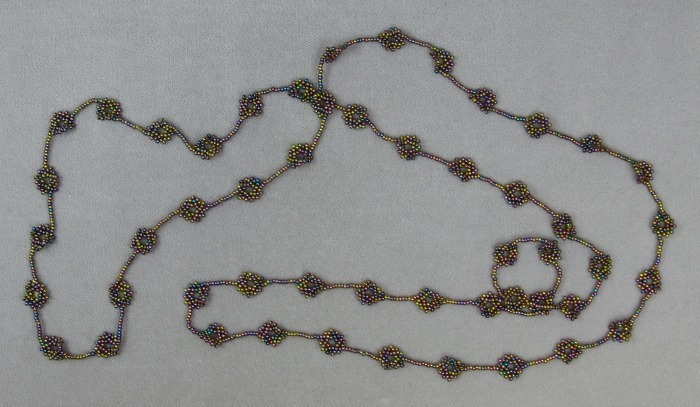 Using different sizes/shapes of beads, you can create this interesting peyote project. Learn to use these new two-hole round beads to create this summery bracelet! Our wonderful friend, Laura, created this design and we simply love it! So does everyone else who sees it, so she's agreed to teach if for us! Using 10/0 or 11/0 Delicas, or 11/0 seed beads, create these fun and relatively easy leaves. They make great earrings, pendants, or attach them to a beaded rope to create a great show-piece! 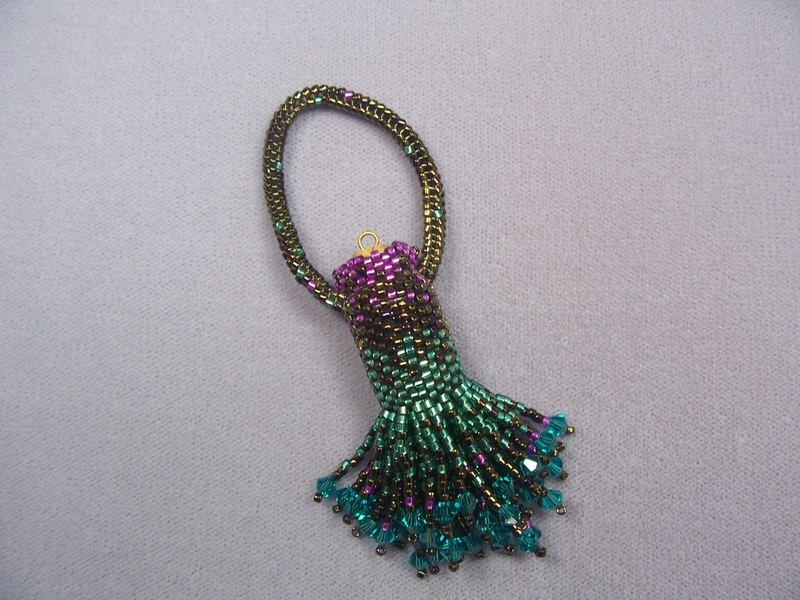 Create this pretty peyote beauty using multiple sizes of beads. It's totally sweet! 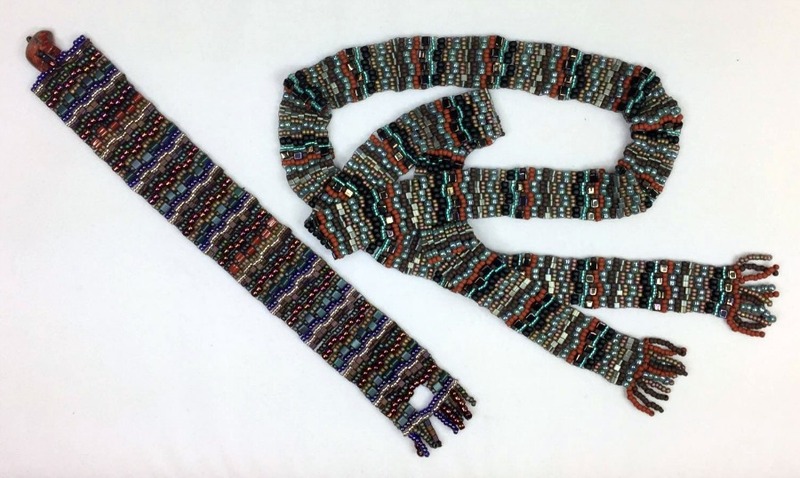 We've used Delica 10/0s for the bracelet on the left (a collapsed tubular peyote - on purpose! 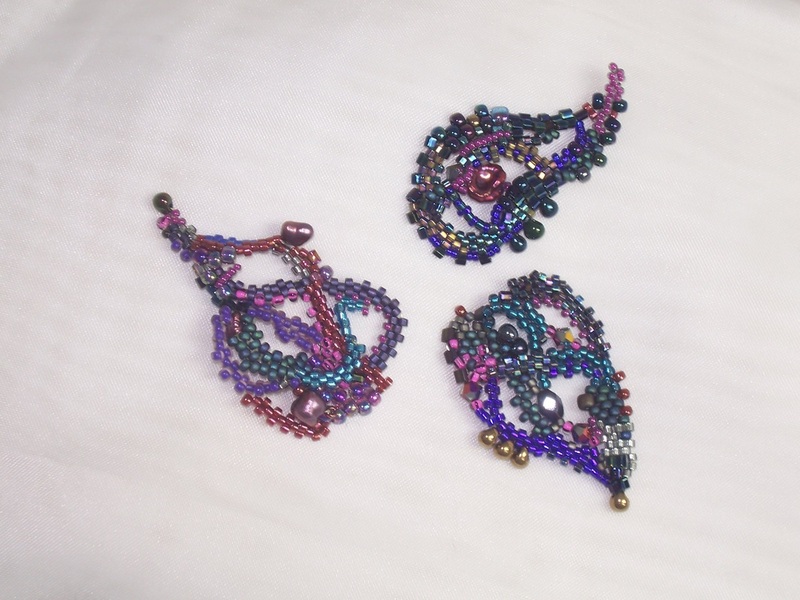 ), four sizes of seed beads for the Cellini Spiral in the center (most variations will do), and 8/0, 11/0, and 15/0 seed beads for the beaded beads on the right! Choose whatever design you like best. 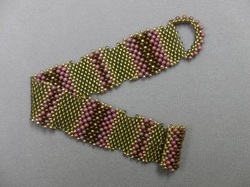 Using a variety of sizes of seed beads, learn how to encase a wooden bead using Peyote Stitch. Peyote the long way! Donna's new bracelet with Delicas and Swarovski pearls.